A last-ditch effort among Senate Republicans to repeal and replace the Affordable Care Act (ACA), popularly known as Obamacare, dominated nationwide headlines in September, and in October, President Donald Trump issued an executive order that would cut critical subsidies to health insurance companies. Now Senate Republicans are trying to use their proposed tax bill to repeal a key part of the law. But while the nation has been fixated on Congress and the president, Republicans in Kentucky have been quietly pursuing a different strategy to undercut Obamacare. In the state that arguably gained the most from the health law, Republican Gov. Matt Bevin is working with the Trump Administration to gut Obamacare without legal battles or congressional votes. Other states with Republican leadership are closely watching Kentucky, and crafting similar plans. If Kentucky succeeds, other states will likely follow like dominos. Obamacare’s success in poor, underinsured states like Kentucky centers around an optional component of national healthcare -- statewide expansion of Medicaid. In 2013, Former Democratic Gov. Steve Beshear expanded the popular federal program that provides healthcare to low-income consumers. It guarantees coverage to all Kentuckians with incomes at or below 138 percent of the federal poverty level, or about one in three Kentuckians. For a brief period, Kentucky had arguably the most streamlined health care plan of the ACA, and brought a historically unhealthy group of people into doctor’s offices and county clinics from the western coalfields to the eastern hills. Then, a populist wave swept Bevin and Trump into office and the ACA into life support. In 2015, Bevin campaigned hard against the ACA and Medicaid expansion on his way to office, promising to dismantle it upon election. He ended up applying for a federal Medicaid waiver, a way to repeal a vast network of benefits under expanded Medicaid without repealing Obamacare or getting rid of federally-funded Medicaid expansion entirely. In August of 2017, the Bevin Administration submitted an application to the Centers for Medicare and Medicaid Services (CMS), the federal agency that administers Medicaid. His application sought to waive the federal Medicaid program in Kentucky and instead use its federal dollars to fund Kentucky HEALTH (Helping to Engage and Achieve Long Term Health), a replacement program he designed. This waiver requires no changes to the ACA, and will be granted or denied by the Trump Administration. If it passes, nearly a hundred thousand Kentuckians will likely lose access to healthcare they received for the first time under Obamacare just four years ago. Beverly May was a nurse in Eastern Kentucky for over 20 years, moonlighting at a clinic for the uninsured in Hazard. Now she’s getting her doctorate in public health at the University of Kentucky. Initially, May appears modest though self-assured, her brushed brown hair and glasses framing a look of concentration. But once she gets going on healthcare, she becomes an authority figure. Her voice grows louder, her hands begin to fly, and a thick accent relays painful stories of how inaccessible basic healthcare was to Kentuckians before Obamacare. “I’m sort of blown away by how cruel the system was,” said May. She worked with patients who were unable to receive health care because they lost their employment, and therefore their insurance, due to workplace injuries. Kentucky became a darling of the ACA, leading the country with the largest decrease of an uninsured population. For the first time, Kentuckians in dire need of care could afford to go to the doctor’s office. With the passage of the ACA, all this began to change. Beshear’s administration created a state-based health insurance marketplace called “Kynect: Kentucky’s Healthcare Connection.” Many states, especially in the South, relied on the federal government to manage their constituent’s health care, sending them to the federal health insurance marketplace to enroll in coverage. While the federal marketplace, healthcare.gov, was critiqued for its glitchy system, Kynect offered easy and accessible ways for uninsured Kentuckians to sign up for Obamacare or Medicaid. In Kynect’s first year, Beshear hired over one hundred staff who ran call centers and set up brick-and-mortar shops in busy spaces. There was a Kynect store in Lexington’s biggest shopping mall, across from the food court. Kentucky was the only southern state to operate a state-based exchange and expand Medicaid. It became a darling of the ACA, enrolling over 475,000 people, and leading the country with the largest decrease of an uninsured population: 64 percent in three years. For the first time, Kentuckians in dire need of care could afford to go to the doctor’s office. Preventative screenings for diabetes, mammograms, colonoscopies, and treatment for chronic conditions all increased, and emergency room visits decreased. This progress was undercut in 2016 when Bevin, his wife, and their entourage of nine homeschooled kids, moved into the Governor’s Mansion. Like Pres. Trump, Bevin ran as an outsider, more familiar with business deals than the work of the political elite. He’s a millionaire who refused to release his tax records, uses social media to post selfies and take down his enemies, and is apt to say whatever’s on his mind. After losing a primary campaign against Sen. Mitch McConnell in 2014, Bevin refused to endorse his challenger. During the 2016 presidential election, Bevin suggested domestic insurrection might be in order if Hillary Clinton was elected. Congressman John Yarmuth called Bevin’s victory the canary in the coal mine for Trump’s. Gov. Bevin took quick action on his campaign promises, issuing five executive orders after his first month in office. Kynect was dismantled within a year, ending outreach efforts and shifting all Kentuckians seeking individual health plans onto the national exchanges. In 2016 he introduced the Medicaid waiver, Kentucky HEALTH, to the public and in August of 2017 sent the final version to CMS for approval. He stated the plan would force people covered under Medicaid to take “personal responsibility” for their health and put some “skin in the game.” Bevin considers Medicaid an entitlement program that puts an unfair burden on taxpayers. Ironically, Bevin, who was born in Colorado, but was raised in New Hampshire, told the press he grew up in a household without health insurance. He remembers things not getting stitched up, hobbling around on crutches with a torn meniscus that his family couldn’t afford to take care of. But Bevin says Kentucky simply can’t afford the additional beneficiaries under Medicaid expansion. The cost to states rises incrementally, and by 2020 Kentucky will pay ten percent of federal dollars brought into the state under expansion, but 90 percent will still be covered by the federal government. Bevin estimates the state would save $300 million over five years with Kentucky HEALTH by cutting the numbers of people eligible. At the same time, the state will give up almost seven times that amount in federal dollars. Bevin’s waiver application estimates 96,687 Kentuckians will lose coverage by the fifth year of cuts. Those in favor of Kentucky’s proposed Medicaid waiver say it would increase personal responsibility and help move people into the workforce. Dustin Pugel, Research and Policy Associate at the Kentucky Center for Economic Policy, argued that the cost of expanding Medicaid in Kentucky paled in comparison to the benefits. “It’s ten percent that we’re kicking out versus 90 percent that we’re getting for free, straight into provider’s pockets. It helps local economies in very real ways,” Pugel said. He says the economic benefits go beyond just increases in coverage. Between 2012 and 2015, the cost of uncompensated care at hospitals dropped by 67 percent. In the first quarter of 2015, Medicaid funded over 9,000 breast cancer screenings and over 5,500 treatments for substance abuse, along with thousands of other preventative services. Pugel said repealing Obamacare and getting rid of Medicaid expansion dollars would cost Kentucky about 85,000 jobs by 2022, almost the number of jobs lost in the 2008 recession. In Bevin’s speech announcing his waiver proposal, he warned that if the federal government did not accept his waiver, he would simply end Medicaid expansion entirely. But Bevin’s team seems confident the federal government under Pres. Donald Trump will approve Kentucky’s waiver. In March of 2017, a joint letter sent out to all 50 governors, actively soliciting waiver applications. Seema Verma, Trump’s appointee for Administrator to the CMS, co-wrote the letter with former Health and Human Services Director, Tom Price, who has since resigned. In 2015, Verma, along with her consulting company, SVC, Inc., developed Indiana’s Medicaid expansion waiver, the Healthy Indiana Plan (HIP). HIP was approved under Former Indiana Gov. Mike Pence, now the Vice President. It creates many of the same barriers to coverage that Kentucky’s waiver would. The list of changes under the proposed waiver is long and complicated. The new Kentucky HEALTH system would create three separate Medicaid accounts for each recipient. It would limit the time period during which recipients are required to re-enroll each year, and it would end coverage of past medical bills (Medicaid currently pays for medical expenses for up to 90 days pre-enrollment). Kentucky HEALTH also introduces a complicated system of payments and penalties that aren’t currently a part of Medicaid. For the first time, people would be required to pay premiums (Medicaid is a free program). For those who make over 100 percent of the federal poverty line, these premiums would range from $1-$37.50 a month. Recipients who cannot afford a premium would instead be charged co-pays ranging from $3-$50. Ironically, these co-pays could end up costing more than a monthly premium. In Utah, Washington, and Wisconsin, charging premiums has led to lower enrollment numbers. In Oregon, premiums cut enrollment by half. Kentucky HEALTH would also introduce a complex system of penalties, centered around a “My Rewards” account that would be used to “buy” extra benefits that are currently covered under Medicaid expansion, including dental, vision, hearing aides or exams, and non-emergency transportation. Recipients earn reward dollars through community engagement or health literacy activities. They can be charged penalties for things like non-emergency use of the ER or missing medical appointments without a good reason. Kentucky HEALTH recipients could be locked out of their accounts if they don’t re-enroll on time, if they don’t pay their premium on time, or if they fail to report a change of income within ten days. Recipients could potentially regain coverage sooner if they take a health or financial literacy class, but they can also be locked out of their medical care for up to six months. Finally, if Kentucky HEALTH becomes the state’s new Medicaid program, it would also require all able-bodied adults on Medicaid to work or volunteer 20 hours a week. Exemptions are made for children under 19, pregnant women, primary caregivers, full time students, and individuals defined as “medically frail.” The work requirement is perhaps the most controversial part of the Kentucky HEALTH plan, as a work requirement as a prerequisite for receiving health insurance is unprecedented and untested. If Kentucky’s Medicaid waiver is approved by CMS, other states will likely follow suit. Since Kentucky sent its waiver in for approval, Indiana, Arkansas, Utah, and Maine have all requested to add work requirements to their Medicaid programs through the 1115 waiver. The Trump administration could approve Kentucky's request any day now. According to public record, over 1,000 Kentuckians submitted comments on the initial waiver application. Almost all opposed it. Among those in opposition was Tina Jackson. Jackson was born with cerebral palsy, a chronic condition that affects muscle movement and tone. She had her first stroke at 23. It took her speech and part of her vision. I met Tina and her husband, Mark, at their house in Louisa, Ky., a small town of about 2,500 residents on the border of West Virginia. Their house faces the railroad tracks, and when trains rattle by, stacked with cars of coal, the light flashes through their closed blinds. Jackson talks to me from her soft red armchair, earrings sparkling and a colorful scarf wrapped around her neck. An iPad sits in her arms and a speaker is pointed towards me from the table next to her. 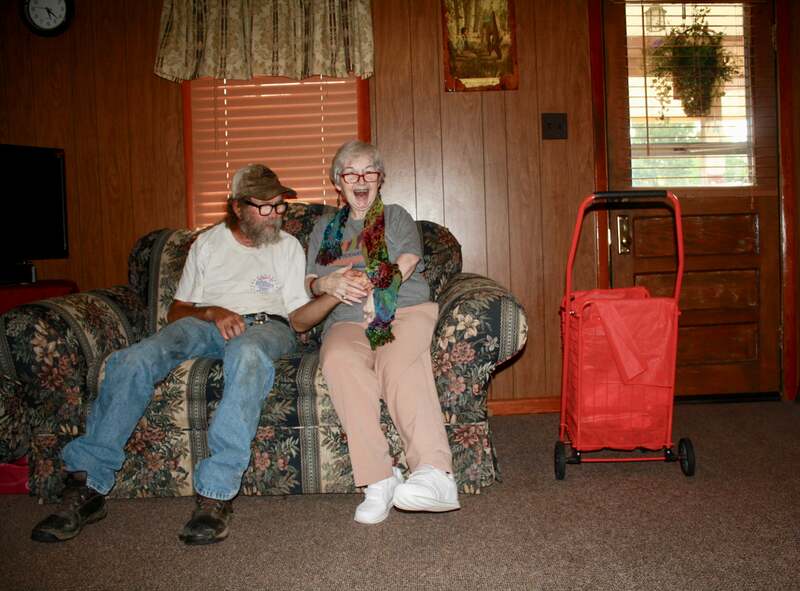 Jackson fears without this aid, she would be housebound or placed in a nursing home. In 2016, she spoke at a public hearing on Bevin’s Medicaid waiver in Somerset, Kentucky. In order to communicate, she used her iPad to read out a message she’d typed letter by letter with her stylus. Jackson asked her legislators to enhance her quality of life, not truncate it. Those in favor of Kentucky’s proposed Medicaid waiver say it would increase personal responsibility and help move people into the workforce. Amy Luttrell, President and CEO of Goodwill Industries of Kentucky, spoke in favor of the waiver at a town hall meeting. She was familiar with the waiver through her involvement with the Kentucky Workforce Innovation Board, a 42-member group that advises Bevin on workforce training and development. Luttrell said Medicaid expansion hasn’t solved all the problems for the people Goodwill serves. She said Kentucky needed more supports to help people leave poverty behind. Luttrell is proud that 80 percent of her employees at Goodwill are currently full-time and qualify for employer-based insurance, though they don’t all take it because of the price. But Luttrell’s goal is to transition her retail staff out of their current positions and into more lucrative jobs in manufacturing, healthcare, and hospitality through long-term support services. “We see work as a critical part of leaving poverty and making someone’s life better...but the right assistance is key,” she said. Her hope is that Kentucky HEALTH would be closer to the “right assistance” to help people out of poverty, though she also understands that even for able-bodied people, there may be barriers to finding work such as transportation, or a lack of available jobs. Bevin’s team argues the program’s purpose is to find long-term work for financial security, including employer-provided healthcare benefits. But as recently as 2015, less than half of private sector firms in Kentucky offered health insurance. Health care advocates share a concern that there aren’t enough job opportunities in Kentucky to support the work requirement. A lot of the new jobs in Kentucky are temp jobs, or retail and service jobs with inconsistent hours. Megan Gammon is a mom of two from southern Kentucky, who’s recognized around town as a curly-haired brunette sporting a faded jean jacket and carrying one son on her hip while she chases another. I reach her by phone, and once she starts talking, she goes a mile a minute, as animated as she is frustrated. She has felt firsthand the effects of being uninsured. She went without insurance for much of the time surrounding the birth of her two sons. Medicaid before expansion covered pregnant women, children, and six weeks of postnatal care. In order to qualify for Medicaid coverage Gammon had to quit a job that didn’t offer pregnancy leave. After her pregnancy, she no longer qualified for Medicaid, and she and her husband, Nathan, were unable to get health insurance through his employer. “For my son’s first year of life, his father worked seven days a week,” Gammon said. No matter how much Nathan worked, no matter how sick or poor his family might have become, the Gammons had no access to health insurance before the ACA. Nathan eventually received employer-based coverage, but Gammon still wasn’t finished with the trials of insurance. Her mother, a lifelong alcoholic and a diehard Republican who opposed Obamacare, was diagnosed with end stage liver disease months before her 60th birthday in 2015. Gammon got the diagnosis after researching the only health care facility that would take her mother without insurance, a medical school in Nashville, Tennessee called Metro Hospital. Her mother could have applied for insurance under the ACA, but believed only “bums” needed it. Gammon begged the hospital to let her mother stay until she could find her insurance. Finally, at the eleventh hour, Gammon found a federal grant that covered a hospice patient under 65 who didn’t qualify for disability or Medicaid or private insurance. It only covered the most basic care: pain medicine, a nurse once a week. It didn’t even cover IV fluids. While on the grant, Gammon frantically applied for disability insurance. Her mother, who had applied for disability unsuccessfully once before, was approved, eight months into her illness and seven months after Gammon had applied. Gammon’s mother passed away on September 24, 2016. Gammon now wonders what could have happened if the ACA and Medicaid expansion existed during her mother’s life, instead of just at the end. Austyn Gaffney is a freelance writer based in Kentucky. Her work has appeared in onEarth Magazine, Southerly, and Vice. You can find her stories at www.austyngaffney.com, and follow her on Instagram and Twitter at @austyngaffney. My son’s life – and death – is the perfect example of how a decent, hard-working person will fare under the Republicans’ so-called “replacements” for the Affordable Care Act – a law that likely would have saved his life had it been in place sooner.